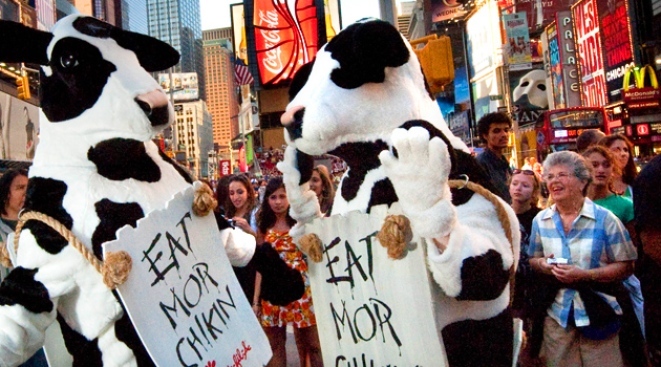 "Cows" swarm New Yorks Times Square promoting Chick-fil-A's givaway. Cow appreciation day? Sure, we'll play along. Today Chick-fil-A is holding its fifth annual "Cow Appreciation Day" -- which means customers who dress up like cows and visit any Chick-fil-A throughout the country will receive a free combo meal for breakfast, lunch or dinner, according to the company. But those too chicken to dress from head to hoof like a bovine won't be left out either. Just present any cow-printed accessory and you can pick up a free sandwich or other item. The Atlanta-based restaurant chain has been using cows as its advertising frontmen to plead the case for customers to "Eat Mor Chikin." The campaign won a Silver Effie Award for advertising and has drummed up a lot of customer interest as well. During last year's Cow Appreciation Day, more than 135,000 people dressed as cows to get a free combo meal and thousands more got a free sandwich. In the midst of a recession where unemployment rates are soaring, company spokesman Mark Baldwin said he expects even bigger crowds this year.